First – before you watch this video, remember I’m no pro letter-er! (Letterist? Calligrapher?) But I’m a type nerd, with a background in graphic design, so I did study a lot about typography, so I do love to play with text. Today’s verse (hopefully if I’ve scheduled this right!) for the 30 Day Bible Lettering Challenge is from Revelations, and decided to turn on the camera in case this worked out. And it did! I even watercolored the stamped flowers with the Sparkle Pens. Watch the video below or click HERE to see it in HD on YouTube. Capturing the sparkle from these pens in a photo is a challenge…my phone did a fair job even if it blew out the color a bit. In the end of the video I did film a little of the twinkliness. These pens come in sets of three – I don’t own them all so can’t swatch em out for you, but maybe someday I’ll go FSS for ya. LOL! I think this is really beautiful Sandy! This is beautiful. 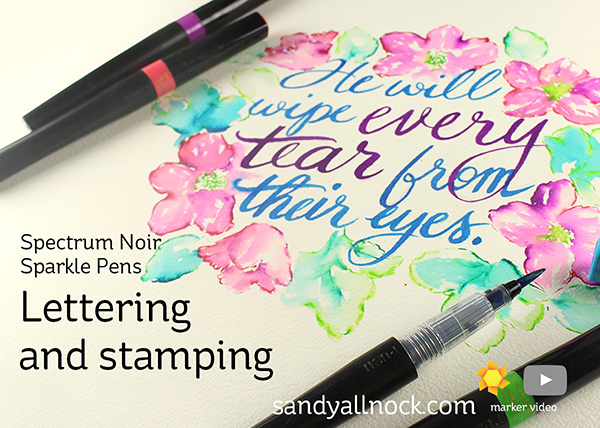 I love your tip on lettering! I think you do awesome lettering…don’t sell yourself short. I have a print I just framed in my home of your lettering and it is a great piece of art. Oh, drat. Now I might need to put these on my wish list. Hard to resist so much sparkle! I think your lettering is beautiful.. I am starting to try a little now, but mostly still need lots of practice. I just heard recently that every thing you need to write is another chance to practice. So I pay more attention to form and consistency even in my grocery lists, which are generally quite fancy anyway because I use my failed card starts for them! Thanks for the inspiration. Sandy, I am inspired by you every day. I love that you showed a good trick for lettering. Your flowers and leaves are gorgeous. Now I’m off to spend a little money at Ellen’s. Thank you! This is absolutely gorgeous! LOVE this! This is great. I’ve been wondering about the Spectrum Noir glitter pens and it’s nice to see them used. Also, thanks for showing a nice way to letter with the tracing and graphite paper. Sandy – this is beautiful. I’m just starting into hand lettering with the intent of learning calligraphy this year. I’m interested in hearing more about the “30 Days of Bible Lettering” challenge. This is gorgeous. 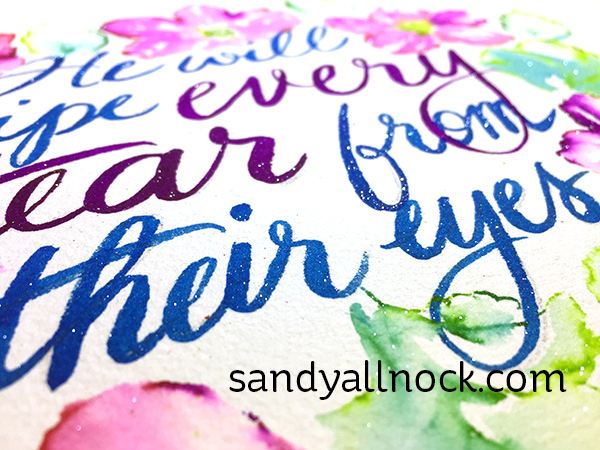 Love the lettering and the flowers, and the sparkle…oh my! Thank you for the video. AWESOME lettering & flower wreath, thanks for the video!